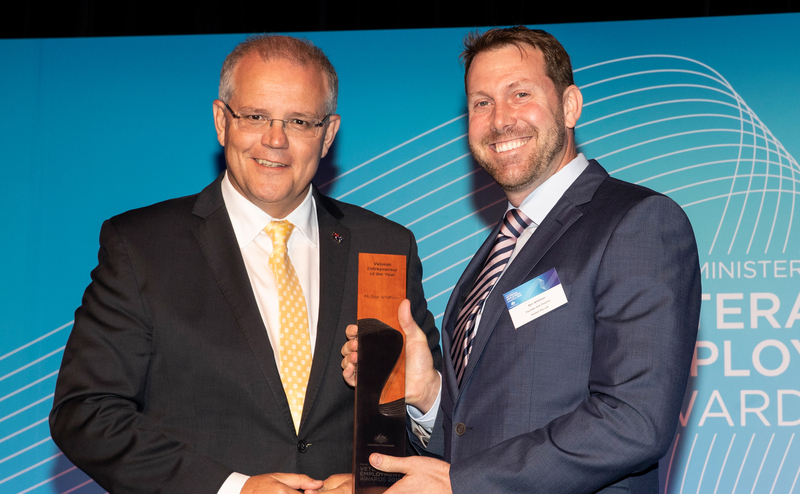 At Parliament House last night Australian Prime Minister Scott Morrison MP presented Ben Whitham, founder of cyber security innovator Penten, the award for 2019 Veteran Entrepreneur of the Year. Established under the Prime Minister’s Veterans’ Employment Program, the Veteran’s Employment Awards recognise national contribution in veteran employment. The inaugural Veteran Entrepreneur of the Year award recognises outstanding achievement by a veteran creating opportunity for Australia through entrepreneurship. Following a decorated career in the Australian Army serving in East Timor, Bougainville, Afghanistan and Iraq, Ben’s transition saw him successfully found three of Australia’s most awarded cyber security and engineering firms AGIS, M5 Network Security and now Penten over the last 12 years. Recognised as Australian Business of the Year at the 2018 Telstra Business Awards, Penten builds cyber security technology to protect Australia and it’s allies and has grown 100% year on year. Minister for Veterans’ Affairs Darren Chester congratulated Ben Whitham and the team at Penten for their win, applauding their ongoing commitment to not only innovation, but to supporting veteran employment. “Ben knows that hiring a veteran is good for business, with one third of the employees at Penten being former serving. Thank you for your service Ben, in and out of uniform,” Mr Chester said.